With one easy-to-use resource, discover all the information you need to understand the most critical updates to the 2015 International Fire Code®, the impact of those changes, and their origins. 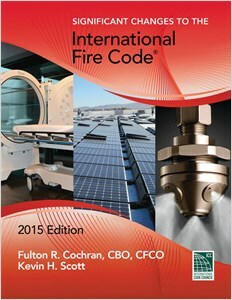 SIGNIFICANT CHANGES TO THE 2015 INTERNATIONAL FIRE CODE® analyzes several of the new or revised provisions in the 2015 IFC®. Each change analysis contains the affected code sections and includes information to help identify if the text is new language, a modification of existing language, or if text has been deleted. The changes are also listed alongside illustrations or examples, in an effort to bring the technical language of the code into a real-world setting. The book's attention to detail, its logical organization, and its thorough yet concise coverage all make it an ideal tool for transitioning from the 2012 IFC® to the new 2015 edition. Facilitates easy understanding of major changes since the 2012 IFC® and provides rationale for those changes. Clarifies the code language with full-color illustrations, photographs, or examples to help in the understanding of the changes. Facilitates quick and accurate identification of key information with a logical organization that follows the layout of the IFC®, including chapters, section numbers, and title format. Improves understanding with detailed table of contents, part summaries, change summaries, and discussion of the change significance. Gives clear notations of all key changes, including deleted code language visualized with a strike-through, and new code language shown as underlined text.